We will check windscreen, lights, horn, washers & wipers, breaks & lines, exhaust, tyres, seatbelts, cooling system, fluid levels, clutch and battery. We will replace oil & filter and washer fluid. We will also road test your car. Everything from Standard Service plus check suspension dampers, idle speed fits new spark plugs ± and air filter. Everything from Premium Service plus replace brake fluid, fit new fuel filter, fit new pollen filter, replace antifreeze. We will also check PCV system, ignition system and emissions. 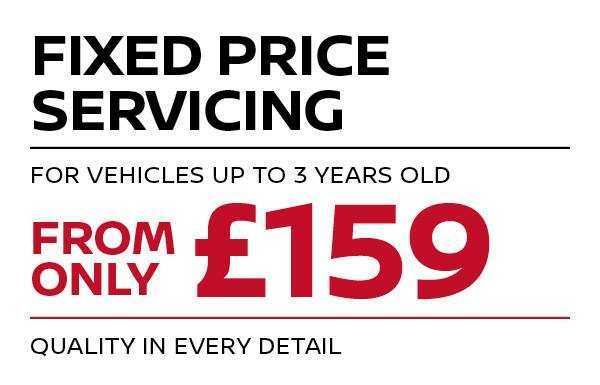 It's worth booking a Nissan fixed price service just for the extras you get! Do you drive a Petrol, Diesel or an Electric Vehicle? Once we have that information, you will receive a price which is dependant on your engine type and the service you wish to have carried out. There will be no hidden extras in the price, what you see is what you get! So why not book your service today? A Free Video Health Check, personalised to your vehicle which you can learn more about on eVision. Free roadside assistance worth £95. Continuous mobility with Nissan courtesy cars and the opportunity to try out electric driving with a 100% Electric LEAF courtesy car. If we are providing you with a loan car, please ensure you bring your driving licence with you. Following the removal by DVLA of the paper counterpart of a driving licence, you will also need to provide a code prior to the collection of the vehicle. To do this, please visit www.gov.uk/view-driving-licence and follow the instructions. Please note that this code is case sensitive and is only valid for one check. 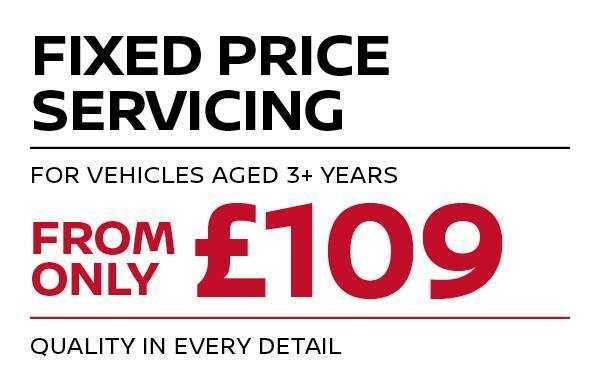 *£109 servicing applies to vehicles over 3 years old on a service standard petrol. Fixed Price Servicing applies to Retail customers only. Business customers must ask Service Advisors for Pricing. Fixed Price Servicing excludes 370z, GT-R, 350z, LCVs, Pathfinder, Navara and e-NV200. Includes labour and certain parts only. Free Roadside Assistance applies to Nissan vehicles only. ** Price Match Guarantee - If you receive a like for like, a more competitive quote within a 10-mile radius of your local West Way dealership, using genuine Nissan parts, we will match the price.